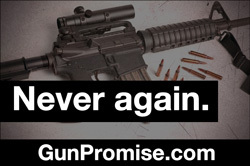 GunPromise.com: Pledge to take action until we win. Every time our country faces a gun tragedy, the big gun manufacturers fund the National Rifle Association to kill action in Congress. "I will not let this moment just fade away. I'll stay involved in the fight for common-sense gun legislation until we win." Note: We don't agree with New York Mayor Michael Bloomberg on much, including his defense of Wall Street banks. But we're partnering with his Mayors Against Illegal Guns organization because of their leadership on this issue. You can tell us if you'd like to get emails from them on this page. Optional: Which apply to you? My comment may be shared publicly. I'm a parent. I'm a gun owner. I'm an NRA member. I'm willing to receive Mayors Against Illegal Guns emails. When asked, I'll call Congress & White House once a month to keep this issue alive. If a gun law isn't passed by summer, I'll attend a congressional town hall meeting. I'd donate to defeat 5 top NRA candidates. How much would you donate per candidate?